Get familiar with a few bathroom flooring materials. 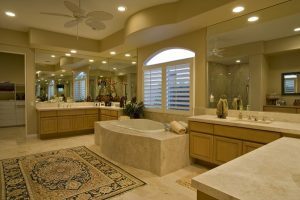 When it comes to renovating your bathroom, many factors go into the whole project. You need to decide the size and how everything will be spaced out along with deciding on materials for every feature. You should take your time when choosing a flooring material for your bathroom because you need a material that is water resistant and durable. Luckily, there are few simple ways to choose the perfect bathroom flooring material. One of the most popular options when it comes to bathroom floors is ceramic tile because it has a clean and polished look. Ceramic tiles are waterproof and highly durable, so you will never have to worry about anything damaging it. The material comes in a variety of designs and styles so that it can blend in with the rest of your bathroom features seamlessly. You can also choose ceramic tile that is slip-resistant to avoid any accidents occurring in your bathroom. One of the most elegant and luxurious bathroom floor material is natural stone. There are many types of natural stone to choose from, but the most popular choices are marble and granite. Both natural stones are water-resistant, so you will never have to worry about damaging it when coming out of the shower. Each stone comes in a variety of colors and styles so you can customize your room to your liking. A popular choice amongst homeowners, vinyl flooring is extremely durable and moisture resistant. So it is one of the best materials if you have children who like to splash water around when they are in the bath. Vinyl flooring is also very simple to install, so you can even do it without the help of a contractor. Rock Tops Fabrications uses the latest technology to ensure that your new bathroom is designed, cut, and finished exactly how you want it. We have over a decade of experience and have been constantly improving our services and offerings to meet the diverse needs of our customers. If you are in the Maryland, D.C., or Virginia area and looking for a beautiful new remodeled bathroom, give us a call at 410-363-4257. For more information and tips on making your home your own, follow us on social media at Twitter, Facebook, YouTube, Google+, Pinterest, and Houzz. This entry was posted on Tuesday, December 26th, 2017 at 11:55 am. Both comments and pings are currently closed.